Remove, frame and finish back. One cout of sheetrock mud cut trim and 1/4 round to fit also cut chair rail to fit using hardy board on out side. Sorry, it is difficult to tell what would you are actually doing. How about some more details? With out having 100% details I would need. I’m thinkin about 800. Removing the door/casing/trim, adding studs, drywall inside, siding outside. 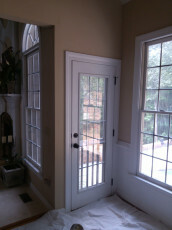 Add priming and painting plus disposal of old door.